Korea is having a major holiday this week — Chuseok (or Hangawi)! 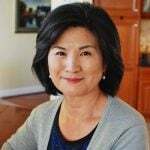 It’s a mid-autumn festival (or Korean Thanksgiving), celebrating the abundant harvest, and paying tribute to ancestors with a scrumptious holiday spread that shows off all sorts of traditional dishes such as galbijjim, japchae, jeon, gujeolpan, and so on. 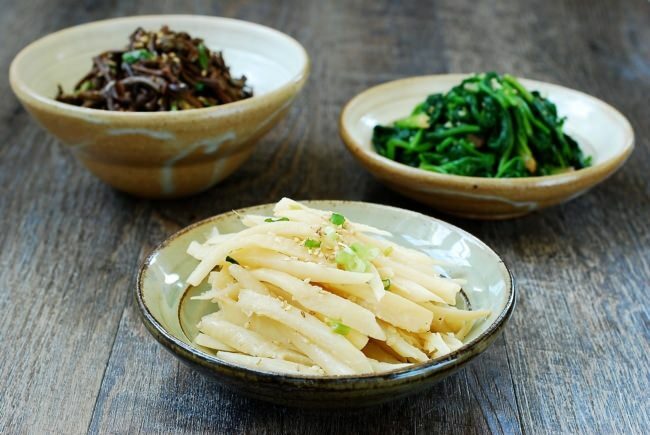 Almost always, a Korean holiday feast includes humble, yet essential vegetable side dishes in three colors — samsaek namul (삼색 나물)! 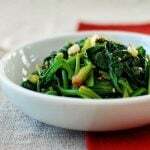 Typically, this trio consists of doraji (도라지, bellflower roots), gosari (고사리, fernbrake) and siguemchi (시금치, spinach). 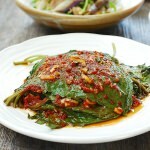 Today, I’ll introduce doraji namul (도라지 나물), followed by the other two in separate posts! 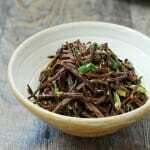 The shorter versions of them are in my bibimbap recipe. Doraji refers to the bellflower plant and its root. It’s also known as balloon flower or platycodon, which is native to Korea and other East Asian countries. 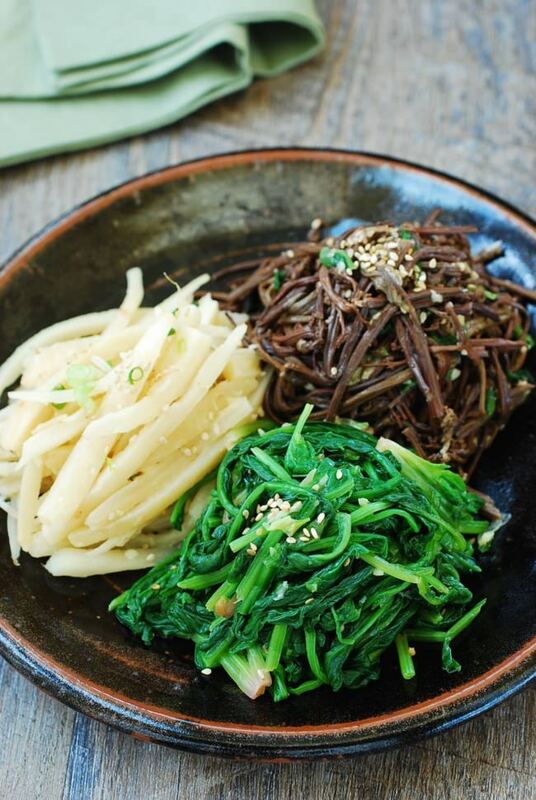 To Koreans, doraji is much more than a common root vegetable. It’s long been used in herbal medicine and as a home remedy for treating common colds, coughs, congestion, and other respiratory diseases. 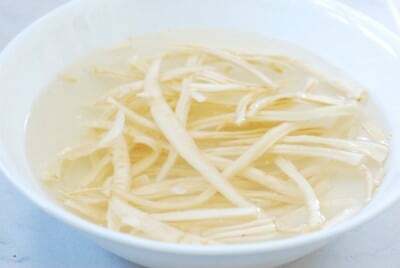 The tough, fibrous roots somewhat resemble ginseng in shape and size. If you’re in Korea, you can easily find them pre-peeled and shredded in markets or from street vendors. 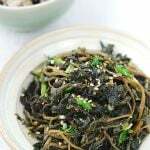 For the rest of us, the option generally is dried doraji packages that are available in Korean markets. Good doraji can be expensive, but it’s totally worth it! Doraji is usually split lengthwise before being dried, so it doesn’t take long to rehydrate. How does doraji taste? It’s quite bitter and slightly peppery in its natural state. So, it’s important to know how to remove most of the bitterness before using it. You will need to rub fresh or soaked doraji hard with coarse sea salt, rinse, and then either soak in water or blanch in boiling water. When properly prepared, it has a hint of sweetness with a slightly bitter aftertaste, that’s unique to doraji, which we love. 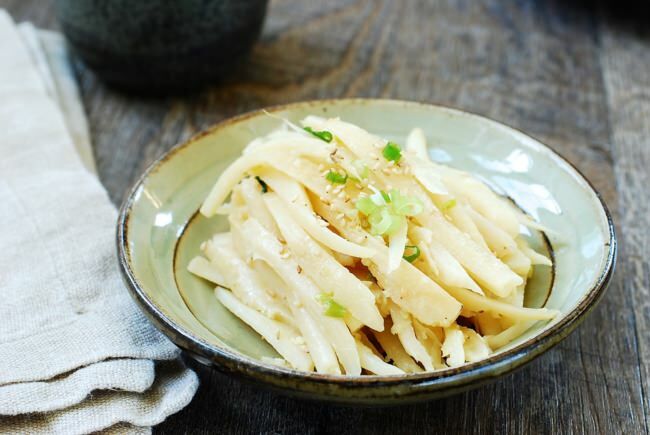 For this white color dish, you can simply season with salt. I usually add a little bit of soup soy sauce. It adds a bit of umami punch without altering the color. 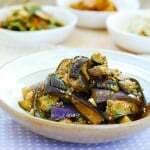 In fact, the soup soy sauce should be your secret ingredient to many namul dishes. 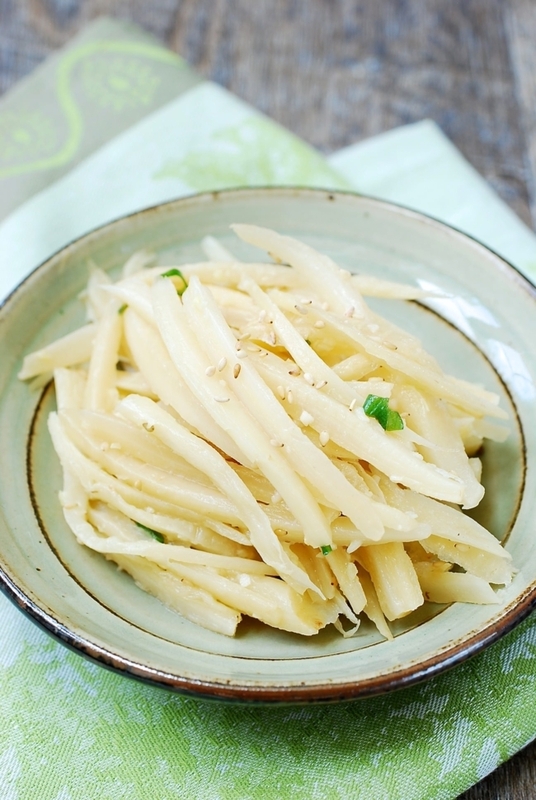 For the purpose of samsaek namul (3-color vegetable side dishes), mu (Korean radish) namul is a common substitute for doraji namul for the white color, although they are completely different in textures and tastes. 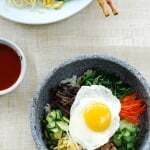 Both dishes are great in bibimbap! 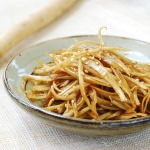 Lightly seasoned and sautéed doraji (bellflower roots)! 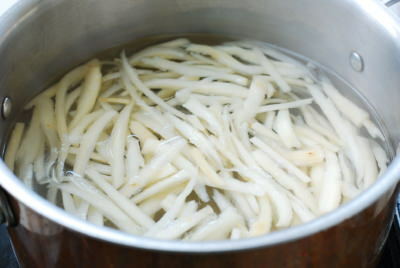 Soak the dried doraji in warm water until softened, about an hour depending on the doraji. 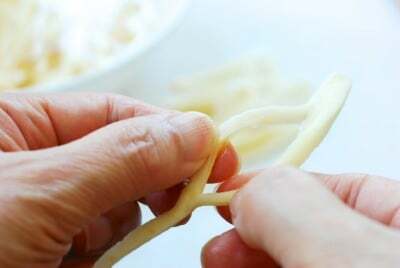 Split each piece into shorter, thin strips with your fingers or a small knife. Add the coarse salt and massage well, in a kneading motion, for a few minutes to remove the bitterness. Rinse a couple of times, and drain. Bring a small pot of water to a boil. 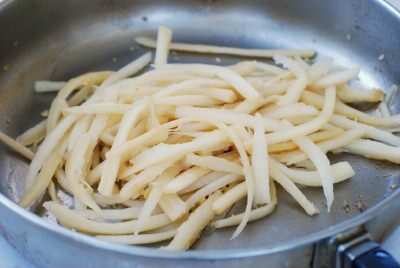 Blanch the doraji for a minute, and drain.You can cook a little longer for softer doraji. 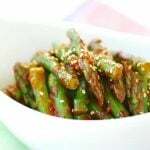 Mix well with the soup soy sauce, salt, garlic, and vegetable or canola oil. Set aside for a few minutes. In a heated pan, saute the doraji for 3 to 4 minutes over medium high heat until the doraji turns slightly opaque. 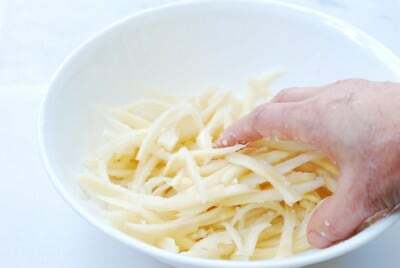 You can add 2 to 3 tablespoons of water if it gets too dry. 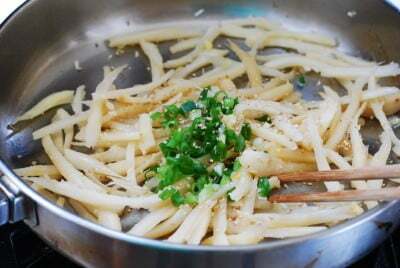 Stir in the chopped scallion, sesame oil, and sesame seeds before turning off the heat. How’s yours white? Mine turned out brown bc of soy sauce.